Joseph Campbell of CFAES’s School of Environment and Natural Resources, who heads the college’s Social Responsibility Initiative, will be one of three featured speakers at “The Effects of Fracking” from 6 to 7:30 p.m. Wednesday, April 9, at Ohio State in Columbus. Presenting the program is Ohio State’s chapter of the Alexander Hamilton Society. Julie Weatherington-Rice, a geologist, soil scientist, and adjunct assistant professor in our Department of Food, Agricultural, and Biological Engineering, discusses “Oil and Gas Drilling in Public Water Well Fields” this coming Tuesday (8/28) at 1:50 p.m. Free and open to the public. 219 Agricultural Engineering Building, 590 Woody Hayes Drive, Columbus, with a video link to 108 Administration Building, OARDC, 1680 Madison Ave., Wooster. Update: Weatherington-Rice presented “Mineral Exploration and Extraction in Public Water Well Fields: An Ohio Legal and Public Policy Perspective” at an Ohio Environmental Council meeting last month. Here’s the slideshow from her presentation. Watch: Can microbes help treat fracking waste? 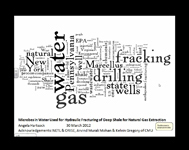 If you missed it last week, Angela Hartsock’s talk called “Microbes in Water Used for Hydraulic Fracturing of Deep Shale for Natural Gas Extraction” can now be seen online (computer slides with narration). Can the microbes in fracking wastewater actually be put to use treating that wastewater? Angela Hartsock of the National Energy Technology Lab discusses her work this Friday (March 30). Her talk: “Microbes in Water Used for Hydraulic Fracturing of Deep Shale for Natural Gas Extraction.” It’s a free public seminar sponsored by the Environmental Science Graduate Program. 244 Kottman Hall, 2120 Fyffe Road, on our Columbus campus. Video link to 121 Fisher Auditorium, 1680 Madison Ave., at OARDC in Wooster. Info: 614-292-9762. OSU Extension’s Joe Bonnell, who’s program director for watershed management, interviews Penn State water quality specialist Bryan Swistock on the impacts of hydraulic fracturing, or fracking, on water. Listen.